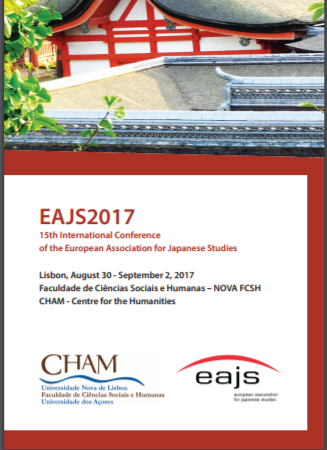 The conference of the European Association for Japanese Studies brought together over 1200 academics and researchers working in the field of Japanese Studies, for three and a half days of presentations and social events, in the beautiful city of Lisbon. There was no overarching theme; instead the panels were organised within thematic 'sections' as per EAJS practice. EAJS wishes to thank all those who participated. The Portuguese Centre for Humanities (CHAM) is an inter-university research unit of the FCSH/NOVA and Universidade dos Açores. It is funded by the Portuguese Foundation for Science and Technology (FCT - Fundação para a Ciência e a Tecnologia), graded with “Excellent” on the last evaluation process of R&D Units (2013-2014). CHAM is currently the main Portuguese Research Unit for Japanese Studies in Portugal; integrates the major number researchers on the field, and publishes the Bulletin of Portuguese and Japanese Studies, a journal focuses on the relations between Portugal and Japan, launched in 2000. As part of its commitment to scientific community and civil society, CHAM is engaged in providing support for the organisation and hosting events such as EAJS. Delegates can download a signed, headed PDF certificate from the login environment.